Lock in a great price for Best Western Plus Northwoods Inn – rated 8 by recent guests! We were upgraded to a king suite a no extra charge! After being in a cramped hotel room in San Fran for 4 nights previously to this ... it was truly a delight to have so much room ! Staff also called and told us not leave our bike on the back of our vehicle as it may get swiped and offered to store it for us which we appreciated! They upgraded us to a 2 queen suite with full kitchen. They should remodel all their rooms to the standards of that one. We didn't have an ocean view but the room was still nice. Having a full breakfast buffet was a great amenity. Loved the family suite! Their breakfast in the morning was good. Free breakfast was great. Staff was very friendly. Super comfy bed, room was awesome and view was beautiful. Their breakfast was great too, it was served in an upstairs dining area with the most beautiful view of the harbor. We lived the breakfast. The walk in shower was amazing. The beds were super comfortable. Comfy bed and decent sized room. Good for a stop over on the way down the coast. Room was clean and comfortable, we had one with our own outdoor patio. It was a quick walk to the ocean. Breakfast was filling and we could watch the sea lions from the window. 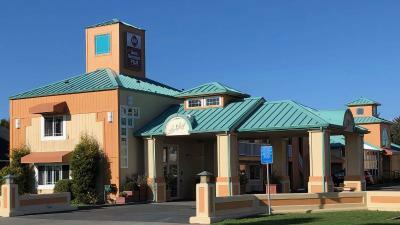 Best Western Plus Northwoods Inn This rating is a reflection of how the property compares to the industry standard when it comes to price, facilities and services available. It's based on a self-evaluation by the property. Use this rating to help choose your stay! Featuring an indoor pool and hot tub, the Best Western Plus Northwoods Inn is 5 minutes’ drive from Redwood National and State Parks. 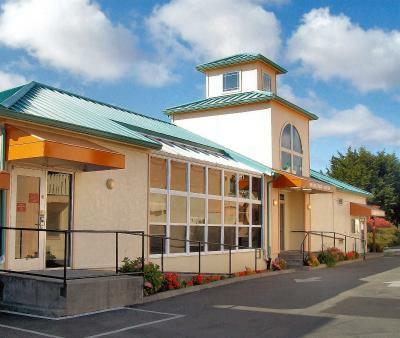 This hotel is located off Highway 101. Free WiFi is available throughout the property. Each air-conditioned room offers a flat-screen TV with movie channels, a desk, and free toiletries in the private bathroom. Open daily for breakfast, lunch and dinner, Northlands Restaurant & Lounge is located on-site at Best Western Plus Northwoods Inn. A poolside hot tub and sauna is provided at Best Western Plus Northwoods Inn. A fitness center, and BBQ facilities are also provided. The 24-hour front desk is available for guests. A business center, meeting space, and laundry facilities are also provided for guest use. The Trees of Mystery are 15 mi away. Ocean World aquarium is a 10 minutes' walk away. This property is also rated for the best value in Crescent City! Guests are getting more for their money when compared to other properties in this city. When would you like to stay at Best Western Plus Northwoods Inn? This room offers a flat-screen TV with cable and movie channels, a coffee machine, a microwave, and a refrigerator. 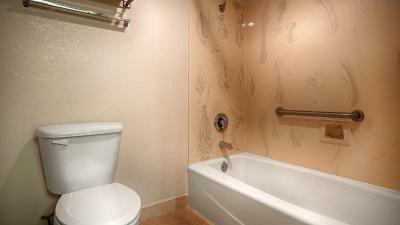 The private bathroom includes a hair dryer and ironing facilities. House Rules Best Western Plus Northwoods Inn takes special requests – add in the next step! Best Western Plus Northwoods Inn accepts these cards and reserves the right to temporarily hold an amount prior to arrival. Please note that there are no elevators available at this hotel. Please inform Best Western Plus Northwoods Inn of your expected arrival time in advance. You can use the Special Requests box when booking, or contact the property directly using the contact details in your confirmation. wifi did not work after a while. The original room in the newer section of the hotel was not serviced from the previous occupant. They were unable to service the room and gave us a room on the lower floor highway side of the building. It was very noisy and loud. It was on easy to get to off highway 101. The first room, a basic double queen, was completely unacceptable. The room smelled and febreeze barely helped. The bathroom was also horrible. The ceiling was so low my husband could put his hand flat on it and he's only 5'7, also the mold one the moulding and wall was bad. The back of the door was also really dirty. We went elsewhere for breakfast. The locations was right off the 101 Hwy and easily accessible. The room was very large and clean with views of the water. Parking was excellent. Breakfast was what you'd expect from a Best Western or the like. That you could hear everything the upstairs people did. Floors above were very squeeky. Description of room was incorrect. I booked the same room last year and was given a room with a separate bedroom. When booking this year they told me it was incorrect and it took me making suggestions on how to make it right instead of them offering solutions. The staff member made multiple comments about that I had booked third party. The room had not been fully vacuumed. Crumbs all over the floor when we arrived in our room. Not enough towels. Hole in the ceiling above the bed. Very nice staff. Good restaurant. Good pool for the kids. We couldn't play pool in the evening as the pool table was too busy. We went back the next morning after breakfast and one of the employees said in a stern voice the area was off limits. When we explained we couldn't play the night before, he just smiled and gestured us to leave. Would it really hurt to let us play one game?